Keyword Competition- This means that how many articles are written related to this phrase the competition metric lies between 0 and 1, 0 means no competition and 1 means highest competition. Problem in choosing appropriate keyword- Bloggers face problems in choosing keyword phrase, because there are tradeoffs among keyword research parameters. For instance, if you select a keyword phrase of high search volume and high CPC. It is easy to observe that there will be high competition. As a result, your article may not rank in high position is SERP( Search Engine Result Pase) result. If you choose low competition keyword the search volume and CPC will be very low. And if search volume is low again the chance of your article in SERP will again Be low. Empirical Formula for Keyword Research - To overcome this problem, I have proposed an empirical formula for you. If you apply this formula you can easily understand which keyword will be appropriate for you. Where KRM stands for Keyword Research Metric. 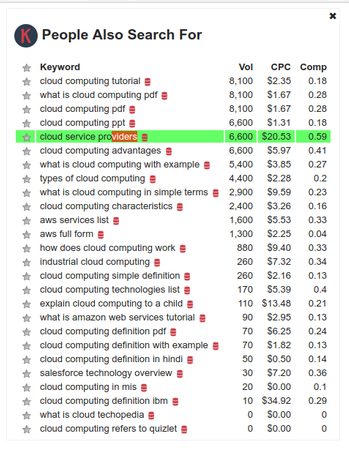 Example if your alexa rank is 200k then for keyword "cloud service providers" the KRM value will be 0.3894. If your Alexa rank is 300k then KRM value will be 0.2596. If Alexa rank is 5000k then the KRM value will be 0.015576. So, use this metric when you are going to choose an optimized values for a keyword phrase. This implies that higher the value of KRM, chances of your article in SERP will be high for that that keyword phrase. Keyword Research Tools- Now I am going to give links of some keyword research tools. In which some of them which are free I have used and some of them which are paid I have heard. Conclusion- In this article, I have explained about keyword research metrics and illustrated by examples. Further, I have proposed an empirical formula that can help you to choose appropriate keyword. Hope this article will help you. Note- I you find any mistakes or you like the article please comment.